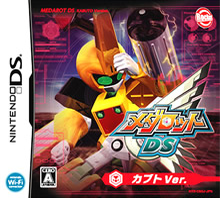 Note: Copy any of the above Medarot DS: Kabuto Version (Japan) rom download links and paste it into your browser to download. mmm in my ttds yhis game says load erros=4 what do i do? how can i get"the Unofficial DSTT Kernelv117 a12rev5"?? also,wht is tht mean?please let me know..
4. find and move _rpg file from wood r4 1.05 to the root of your sd card. Then find the .nds file and place it at the root as well. Now in the same file as the child's play patch move the infolab.dat and extinfo.dat to the _rpg folder. all didn't work for Supercard SD (normal not light or one). Okay I just found out that all you have to change in the wood r4 settings is to turn the reset to off for the game to work. Thanks for putting my advice on the top of the forum, I DID NOT STEAL THIS I discovered this myself. Anyway forget the first part of my last comment you still don't have to change the save to no save type instead just change the reset in game to off and the change save slot to default. The patched game doesn't work because it's unable to reset and it's unable to save because (I still don't know why lol XD). If you don't use an R4 clone I advise you to change some settings in your flashcard's kernel to something like how I had, remember you need EXTINFO.DAT and INFOLIB.DAT and you need to turn off the reset setting.